Fine. In fine packaging. Idina Menzel-Wicked [Original Broadway Cast Recording] by Idina Menzel. Very Good. In very good packaging. Idina Menzel-Wicked [Original Broadway Cast Recording] by Idina Menzel. Schwartz. Very Good. In very good packaging. 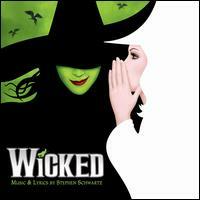 Cast Recording-Wicked-Original Cast Recording by Cast Recording. Just saw the play in Orlando, Florida and feel in love with the music. It is amazing.